The much-missed Status Quo rifflord bows out in style on the first, and only, solo album. Now that Status Quo icon Rick Parfitt has passed it would be very easy to fill any review of his work with false platitudes and hindsight sentimentality. He certainly did not get much love and respect from journalists and music critics when he was alive and thrilling hundreds of thousands of fans every year but since his untimely passing on Christmas Eve in 2016 the written press has been much kinder and more respectful of his contribution to popular music. Passing away so close to celebrated popstar George Michael no doubt meant that the six-stringer took less than his fair share of column inches, similar to when 1980’s Hollywood star Farrah Fawcett passed away on the same day as the King of Pop Michael Jackson. However, his legacy is untouchable and irrespective of what the music press may think he is rightly considered one of the finest rock musicians the UK has produced, and, as always, he seems to have the final word. 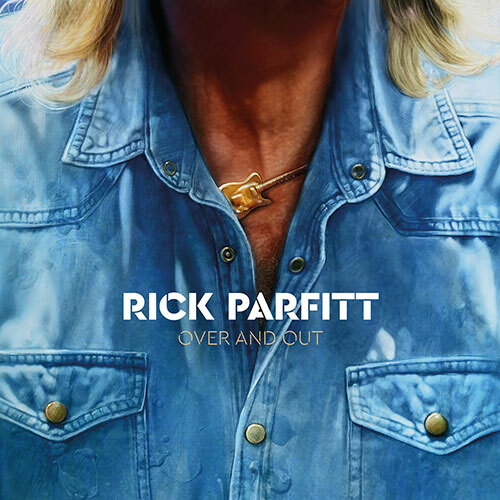 As you might have expected some of the tracks on the album would have fit very neatly into a Status Quo release, such was his influence on the sound and energy of the band, but there are many sides to Rick Parfitt that playing with Quo alone would not bring to the fore. This album is a complete musical journey of his influences and shows that he is far more than just a rhythm guitarist with a penchant for creating memorable riffs. Opener “Twinkletoes” is driving rocker of the sort that made him famous and cemented his reputation as one of the great riff writers that music has seen. It is arguably the most Quo-like track on the album and is sure to please fans and it starts the album off in fine fashion. “Lonesome Road” follows in true Parfitt fashion, a mid paced roller that flows like a steady river but gradually gets quicker as it heads towards the waterfall and crashes down to the rocks below. The pulse drops a bit with the title track “Over and Out” which is a fine melancholic look at a life well lived and it is no surprise to note that it was played at Rick’s funeral, leaving not a single dry eye in the house. A man of many strings to his telecaster he changes tack with the soulful pop of “When I Was Fallin’ In Love” which displays his fine voice, criminally underrated by many. Rockabilly makes an appearance in the guise of the funky “Lock Myself Away”. As you would expect a man of Mr Parfitt’s calibre has made many musical friends over the years and Queen’s Brian May and Muse’s Chris Wolstenholme are a couple of his close friends who have contributed to the album, alongside bandmates Rhino Edwards and Alan Lancaster. Given the fact that Rick died before full completion of the album, although fortunately he had completed vocal and guitar parts, it has been a huge group effort from friends and colleagues to make sure that his voice is heard for the final time. Back to the music and “Fight For Every Hearbeat” is a full-on classic that satisfies every denim-wearing rockers wishes. Although the title of best track on the album goes to hard rock strut of “Long Distance Love”, a track that demands repeated listens. Parfitt turns his hand to the Blues on “Everybody Knows How To Fly” and it’s as good as you think it will be. The same can be said for the album as a whole. A fine final reminder of why he was so loved and admired. Over and Out. Job done. Thanks for memories Rick. Over and Out is out now through earMUSIC.